You may look at the premise for The Gift and think that you’ve seen this before. Creepy guy who stalks married couple. But it’s not exactly about what happens–more so, why. Joel Edgerton has outdone himself with his directorial debut.The film has a lot to say and gets its points across well. 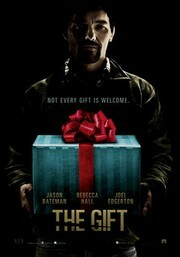 The Gift begins with a couple, Simon (Jason Bateman) and Robyn (Rebecca Hall), who has just moved back to California. Simon runs into an old high school acquaintance, Gordo (Edgerton), who seems a bit odd. He keeps giving them unwarranted gifts and needs to be needed a little bit too much. The couple’s new life becomes dominated and overrun by Gordo’s existence. The film starts out as a complete thriller. It’s filled with all the cliches–not necessarily in a bad way. Paranoia runs rampant in the mind of Robyn, who works from home, as well as the audience’s. Simon seems collected and just chocks it up to Gordo being a weirdo, since he’s always been weird. But thriller turns into mystery when Robyn starts investigating exactly why Gordo is torturing them and what lies in his past. The acting is truly amazing. Each of the three leads has conviction in their roles and, along with Edgerton’s direction, bring amazing depth to each of them. With most psycho-thrillers, it doesn’t come without its share of head scratchers, but they’re not terribly debilitating to the film and you enjoy the rush so much that they don’t really matter. Without giving too much away, The Gift is definitely worth the watch. It’s one of the best psycho-thrillers to come along in awhile.